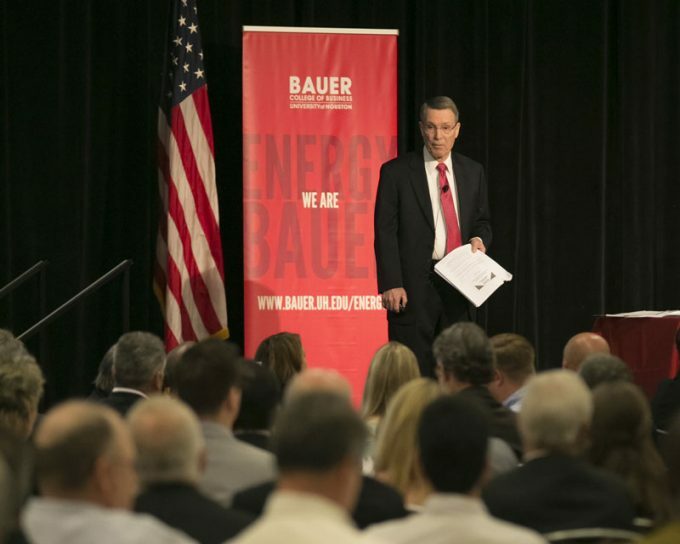 Bauer College Institute for Regional Forecasting Director Bill Gilmer gave his update on the Houston economy, and what’s in store for 2017, during the fall symposium. See more photos from the event on whereawesomehappens.com. The Institute for Regional Forecasting at the C. T. Bauer College of Business held its Fall Symposium on Nov. 10, with director and noted economist Robert W. “Bill” Gilmer providing a recap of Houston’s economy in 2016, and his insight on economic prospects for Houston in the coming year. The symposium — titled “Waiting on Oil Markets: Houston’s Economy Seeks Direction” — addressed the progress on oil markets, the U.S. economy and where the Houston economy goes from 2016. “We are not in recession, or, we may have had one early this year and we didn’t know it. If we’re going to have a recession, that’s the best place to have it,” Gilmer said. Gilmer also added that overall, job losses in Houston in 2016 may total 254,000 after data are revised, a modest lost, considering the loss of 80,000 in the oil industry during the drilling downturn. Additionally, oil and gas is looking to level off now that the drilling boom and bust are behind us. “We’ve come to the end of one of the greatest oil booms, and hopefully, we can say we’ve come to the end of the biggest bust,” Gilmer said. Overall, Houston will likely see a stagnant year with petrochemical construction coming to a close and drilling activity picking up slowly, Gilmer said. Gilmer will share his next set of projections at the Bauer Institute for Regional Forecasting’s Spring Symposium in May. For more information on the IRF and Gilmer’s presentation, click here.